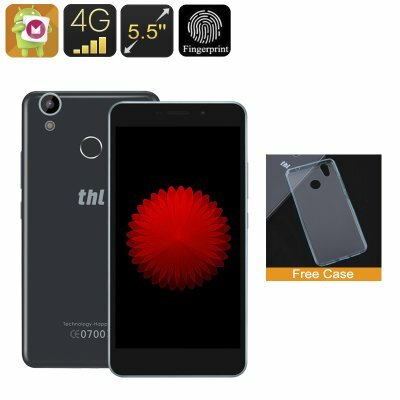 Successfully Added THL T9 Smartphone - 5.5 Inch HD Display, Fingerprint Scanner, Quad-Core CPU, Dual-SIM, 4G, Android 6.0, 3000mAh (Black) to your Shopping Cart. The THL is big on visuals with is 5.5 inch large screen it fits right into the phablet category and beings high definition resolutions for a delightful, immersive viewing experience. now you can enjoy games, movies and surfing the web with so much more detail on the screen. With its MTK6737 chipset the THL T9 is offers a faster and smother performance than previous MTK6735 phones. This means it handles multitasking and switching between different apps without you experiencing lag. Using an Android 6.0 operating system streamlines the performance and also adds to the efficient operation and performance while displaying all you need in a easy to navigate interface. To keep you connected for longer the THL T9 Smartphone brings a big 3000mAh battery that's no mean feat when the phone is only 8.5mm thick. now you can enjoy many hours chat and usage time or days in standby from each and every charge. The THL T9 Smartphone comes with a 12 months warranty, brought to you by the leader in electronic devices as well as wholesale Android smartphones and phablets.